Account allocation is the link or association between a transaction or credit note to an invoice. If you create standalone credit notes or payments on account for a customer or supplier, you can allocate these to one or more invoice from the Account Allocation option. You can only use this option to allocate outstanding transactions together, including quick entry transactions. You can’t use it to record a payment or a receipt. If you need to record a customer receipt or supplier payment you must do this from Banking. You can use the Unallocated Receipts or Payments report to easily identify sales receipts and purchase payments that aren’t allocated to a specific sales or purchase invoice. If you’ve already allocated a transaction and you need to remove the allocation, for example, you allocated a credit note to the wrong invoice, you can unallocate it. You can allocate outstanding invoices to payments on account and credit notes, including quick entries. Alternatively, if the invoice and credit note are the same value you can use the More option on the action toolbar from the Sales and Purchases tabs. 1. Click Contacts then click the required contact. To allocate all transactions at once select the check box at the top left-hand corner. To allocate individual transactions together select the check box for each item. To allocate part of a transaction to another, for example, if you want to credit part of an invoice, click on the transaction you want to part pay, a pop up window will appear, enter the value in the Amount to pay section and click Save. As you allocate the transactions, the Left to allocate changes. This must be zero before you can save the allocations. 3. Once the Left to allocate is zero then Save. If you use the VAT Cash Accounting Scheme when you create a payment on account, you pay VAT to HMRC at the time you record the payment. If you now allocate this to an invoice with a different VAT rate, the original payment is reversed and another payment is posted with the new VAT rate. 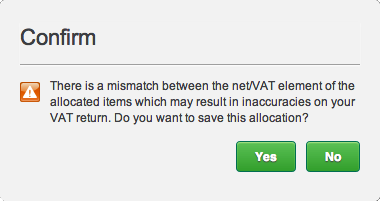 If the previous transaction was VAT reconciled, the adjustment is included on your next VAT Return. You’ve successfully allocated the transactions and the outstanding value on the contact’s activity for these transactions shows as 0.00. You can easily view which payments and receipts have paid off your sales and purchase invoices, as well as which invoices and credit notes have been allocated together. 1. Locate and open the invoice or credit note from the activity section on the contact record or, from the Sales or Purchases tab. If you use the VAT Cash Accounting Scheme and you try to allocate invoices and standalone credit notes which have different VAT rates, the following message appears. On this scheme, the VAT calculated on invoices is placed in a VAT holding nominal ledger account until you record a receipt or payment. Once you record the receipt or payment against the invoice, the VAT moves to either the VAT on sales or VAT on purchases nominal ledger account and is then included on a VAT Return. If no payment is received and instead you create an invoice and then issue a credit note, this removes the value in this account meaning no VAT is due. If the credit note has a different VAT rate, a value remains in the holding account. You issue an invoice for £100 plus VAT at the standard rate of £20. The customer pays the invoice and the receipt appears on your VAT Return. The customer then returns the items because they were faulty, for which you issue a credit note. The credit note leaves a debit balance of £20 in the VAT on sales holding account. If you allocate the credit note and the new invoice, this leaves an outstanding debit of £1.50 in the VAT on sales holding account. As credit notes aren’t included on VAT Returns on this scheme, it means you overpaid VAT when the original receipt was included on the return. Click No. Issue a refund for the credit note and record the invoice as paid. The refund and payment are included on the VAT Return ensuring the difference is included. Your bank balance doesn’t change as the refund and receipt are for the same value and cancel each other out. Unallocate the original receipt and invoice. You can then allocate the credit note to the original invoice and the receipt becomes a payment on account which you can allocate to the new invoice. Ledger Account* Debit Credit Include on VAT Return?